Re-reading what I'd written for this I realised that the first line: "I'm supposed to be on holiday" had a totally unintended double meaning. I saw The Dark Knight Rises at the IMAX last week. My thought before I saw it was that I would use this little space here to vent all my thoughts and feelings and then - you know - sync that in somehow with The Long Halloween: one of the "big" Batman books that I somehow haven't gotten around to yet. 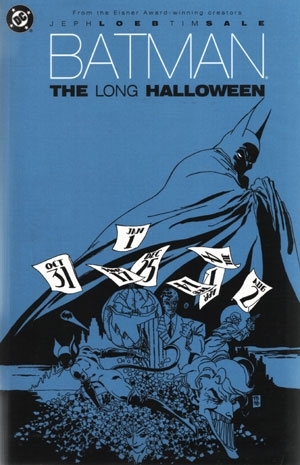 In fact: there's a lot of people out there that would say (in fact - Michael - one of our Comic Forum regulars - declared this to everyone at the last meeting) that The Long Halloween is the best Batbook out there. And even Sean T Collins (currently my go to for funny/interesting/insightful Comic Book writings ) included it in his Rolling Stone Piece: The Dark Knight Reads: Fifteen Essential Batman Graphic Novels  - but for me - I dunno - The Long Halloween kinda struck me as being a little childish. No - wait - that's not quite right - more like a kid's idea of what a grown-up Batman comic should be - a little like Christopher Nolan's Batman films kinda - or maybe someone who thinks that the Batman: Animated Series is the pinnacle of everything that Batman should be : I mean yeah ok - it gets past the cookie cutter Batman story that we've all heard so many times (namely: Badguy threatens Gotham, Batman does some detective work, big climax on a roof somewhere, there's a struggle - maybe a little dialogue about how "we all wears masks don't we" - and then Batman saves the day - end) and - wow - yeah - picking it up - it certainly is aptly named: book is long and hefty and (oh!) I'd forgotten this - but the very first line "I believe in Gotham City" has a construction familiar to anyone who's seen The Dark Knight . But - I dunno - in the introduction Jeph Loeb talks about how the original idea of the whole series came from his editor Archie Goodwin who made a few comments about how good it would be to see Batman go up against some Gangsters - and that's pretty much all the book is: The Gotham version of The Godfather - only it's all decoration with remarkably little filling. Like it says in the Jeph Loeb written-introduction - The Long Halloween picks up where Frank Miller's Year One leaves off (altho Tim Sale's artwork is leans much more in a Sin City kinda direction - all jutting boxes and thick shadows) it's Batman in his early days - still trying to find his Batfeet (and quite frankly doing a pretty awful job at it - thought this guy was supposed to be the world's greatest detective?) but for me it was the Nolan Batman films that kept coming to mind (and oh man any money that Christopher Nolan has a signed copy of The Long Halloween sitting on his bookshelf): Commissioner Gordon as a lowly Captain. Big piles of cash on fire. Harvey Dent doing District Attorney type stuff. Faked deaths. People disguised in bulky SWAT team get-ups: it's like The Dark Knight only without all the great Heath Ledger stuff . Reading The Long Halloween was - I dunno - slightly depressing I guess? I mean a big part of that is probably down to the fact that I've already read it a few times before: I imagine the first time it was pretty alrightish - but it's like meeting someone that only has one thing to say - having a fun time but then each successive time falling prey to the law of diminishing returns. None of the characters feel like human beings - more like icons or mascots or something - and what you see is all you get: there's a bit where the Joker rides around in a biplane and it just feels - like a cartoon : there's no real sense of danger or anything really - it's just a pretty image. And comparing it - well - the Frank Miller Batman stuff (any one of which I would have preferred to be reading): there's always a sense which those books that there's a really realized world (be that the more realistic Year One or the more cartoony Dark Knight Strikes Again) that you're just getting a glimpse into via the story that's being told - while The Long Halloween (not that it's the worst offender of this type of thing - but oh well): it just feels like the world is just what's on the page - and so it's all paper-thin - one-dimensional - lacking any real sense of depth: yeah - it's pretty and the architecture and giant halls and stuff certainly make a visual impact (every splash page is like WHAM! a smack against the eyes) - but it's all just I dunno - pretty pictures - with very little feeling of connecting tissue other than: can you guess who the Holiday killer is? And who is the baddie for the this chapter gonna be? 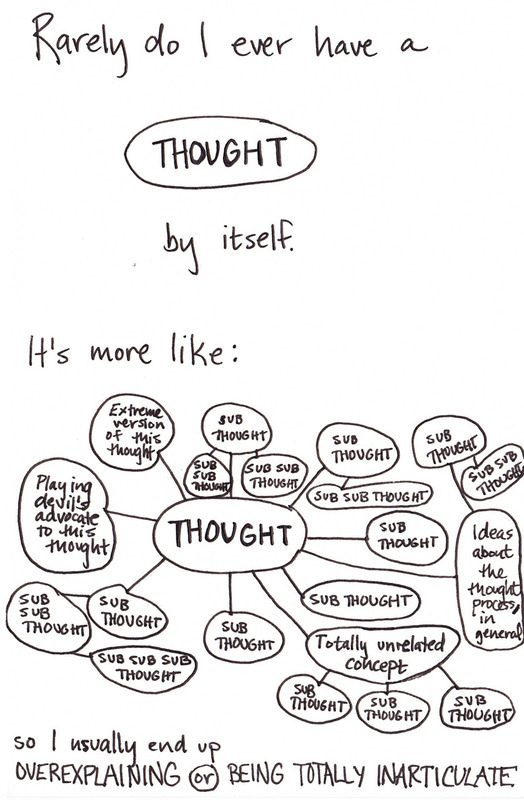 (In fact at times - it feels like less a story and more like reading a schematic diagram - and now this bit connects to this bit - and this part makes this happen). Trying to get to the root of what I'm trying to say (and thanks for hanging in there) I guess my issue with The Long Halloween is that it treats the idea of Batman (and everything that comes along with it: Bruce Wayne, The Bad guys, Bat-Signal etc) as a given and then builds from there: as if the risk of picking these things apart or subjecting them to closer scrutiny (wait a second - he dresses up like a giant Bat?) runs the risk of collapsing the foundations and bringing everything tumbling down - as if Gotham is a place you visit in a dream (which I guess - in a sense it is - a shared collective dream that holds sway over us all): a place with it's own rules and it's own topsy turvy gravity and any small move or raised eyebrow of incredulousness means you have to wake up. And yeah - obviously there's no lack of Batman comics that have the same tendencies - but then: damnit - when there's Frank Miller (and hell to a lesser extent Grant Morrison) elevating things several levels above - what are you doing wasting your time on stuff like this? What are you - twelve years old? It's Number 9: "Superstar writer (and current Marvel exec) Jeph Loeb's noirish year-in-the-life story about the young Batman's hunt for a serial killer features too-liberal cribbing from The Godfather and plot holes cavernous enough to park the Batmobile in. His real talent lies in providing a parade of jaw-dropping images for his artists to draw; in this case, that means his frequent collaborator Tim Sale, who gets to put his unmistakable stamp on nearly every iconic Bat-character. His every moody, expressionistic page is suitable for framing." Read more: here (Note: The Dark Knight Strikes Again isn't listed tho which in my mind is a frigging travesty). Not that I wanna diss the Batman: Animated Series - I mean - when I was twelve years old I frigging loved it. Only - I'm not twelve years old anymore (sad fact). And indeed it's only 10 pages further in that we get to Bruce Wayne saying: "I believe in Harvey Dent" and issue one ends with a triple whammy: "I believe in Jim Gordon. 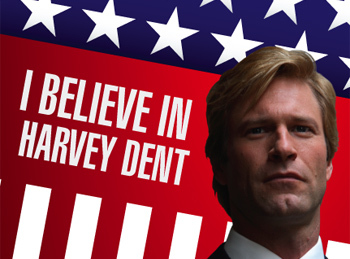 I believe in Harvey Dent. I believe in Gotham City..."
 This would be the point where I'll say that the comics that The Dark Knight Rises (which - no - I didn't much like) most brought to mind where Paul Pope's Batman: Year 100 and Frank Miller's Batman: The Dark Knight Returns (both of which I've re-written - so go check those out): only more in a: man I wish this film was much more like those books. Instead of being - well: Nick Southall says it better than I could (in fact - a good (albeit slightly harsh) description of the Dark Knight Rises which spins to mind is that it's like The Dark Knight Returns if it was rewritten and redrawn by Jeph Loeb and Tim Sale). Not that I have a problem with cartoons you understand. Or - hell - even stuff feeling cartoony. It's just - when you tell that people are trying to be all serious and mature and dark and edgy - it's doesn't work when one of your characters has a giant purple tail. And - oh yeah - also having been stabbing in the frigging back! Links: Comics Should Be Good Review, Graphic Novel Reporter Review. Further reading: Batman: Year One, Batman: The Dark Knight Returns, Batman: Year 100, Batman: Dark Victory, Batman: Batman and Robin, Batman: Broken City. I think you're being a bit harsh on this and expecting it to be something it's not. It does probably read best when you're twelve or thirteen, but what's so wrong about that? That's the perfect age to be reading stories about people dressing up in strange costumes and hitting each other! I mean - I guess it's not the books fault that it's been hailed as "one of the best batman stories of all time" etc etc: and yeah - if you're twelve and you wanna read something that makes you feel a little bit sophisticated (god - it lifts so much from the Godfather that I think that they must owe Francis Ford Coppola royalties or something...) it's just that - there are so many better books out there and so many other better Batman books that I thought I'd try and write something to course-correct (or whatever).